Normally I despise onions. Raw onions are disturbingly crispy and taste like I’m having the inside of my mouth bleached. Cooked onions remind me of slimy translucent worms. Plus I hate chopping them because of course my eyes are THE MOST REACTIVE POSSIBLE to onion fumes. The burning! The tears! I even kept swim goggles in the kitchen junk drawer to wear when I made guacamole (I mean, you can’t skip the onion in guac, even if you don’t love it). But things have changed, y’all. I feel like the Grinch when his heart grew three sizes. Because onions are the best thing about this quiche. I first tasted it at an office party, thought to myself “ye gods! this is the most beautiful and joyous thing I’ve ever masticated,” stalked my colleague until she emailed me her recipe, and then felt my heart sink when I saw that it called for 1 large onion. Eeep. But I conquered my fear, threw an onion into the food processor so I didn’t have a quiche full of large oniony chunks, and never looked back. The flavor is…well…I have no words. Just try it (recipe below). So the aforementioned onions are sauteed in an entire stick of butter until everything gets brown and awesome. Yes, an entire stick. Don’t skimp. This mellows out the onions, adds a sweetish, nutty flavor, and makes the egg mixture lovely and smooth and silky. YES IT HAS CREAM TOO. Who are you, Jillian Michaels? Just climb off your treadmill and make the quiche. Life is too short to not taste its buttery-creamy-oniony magicalness. If you spend an hour in the kitchen slaving over this masterpiece of a quiche, then by gum, you deserve some booze to go with it. Splash together some OJ and cheap champagne, maybe put the football game on TV, and you’re in business. 2. Put onions and garlic in food processor and pulse till finely diced. Melt butter over medium heat, add onion mix, and saute for 10-15 minutes. Cool slightly. 3. Poke holes in your crusts with a fork and partially bake for 7-9 minutes. 4. Mix eggs and half-and-half in large bowl till well-blended. Add onion/garlic/butter mixture and salt and pepper to taste. Stir in 2 cups of cheese, your meat and veggies, and pour into pre-baked crusts. Sprinkle remaining cheese on top. 5. Brush crusts with eggwash (beaten egg plus a splash of water or milk) if you like a nice golden brown look. Bake for 45-55 minutes till egg mixture no longer jiggles. Enjoy! These are just a few ideas, but there are infinite possibilities using these and other ingredients. 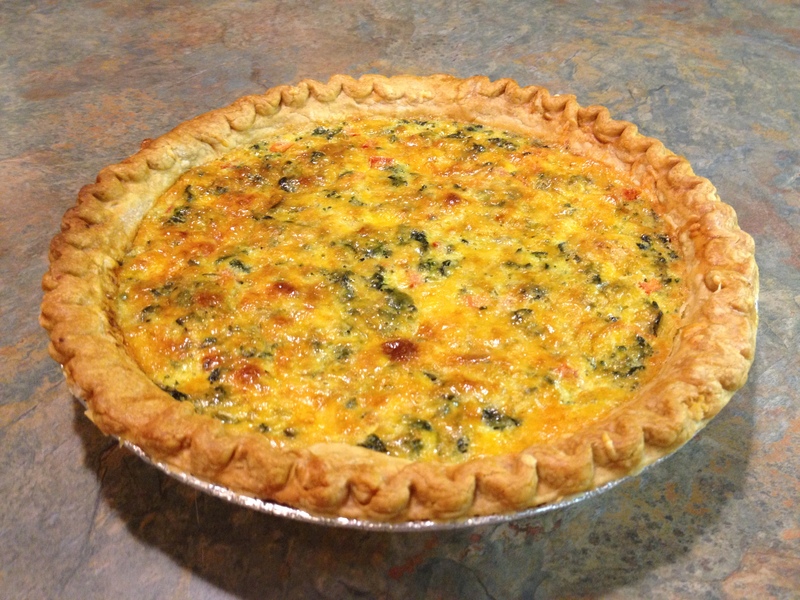 Southwest quiche! BLT quiche! Broccoli cheddar quiche! Use your imagination and go wild. Cook 1 package bacon on a baking sheet in 400 degree oven, then crumble or layer in bottom of crust; saute 2 cups mushrooms in butter till browned; finely dice 1 Roma tomato. Cook 1 ribeye steak to your preference, slice thinly and layer in bottom of crust; saute 2 cups mushrooms in butter till browned. Boil 5 chicken tenderloins and chop fine; microwave box of frozen spinach for 6 minutes, use half; Parmesan cheese goes nicely with these flavors.